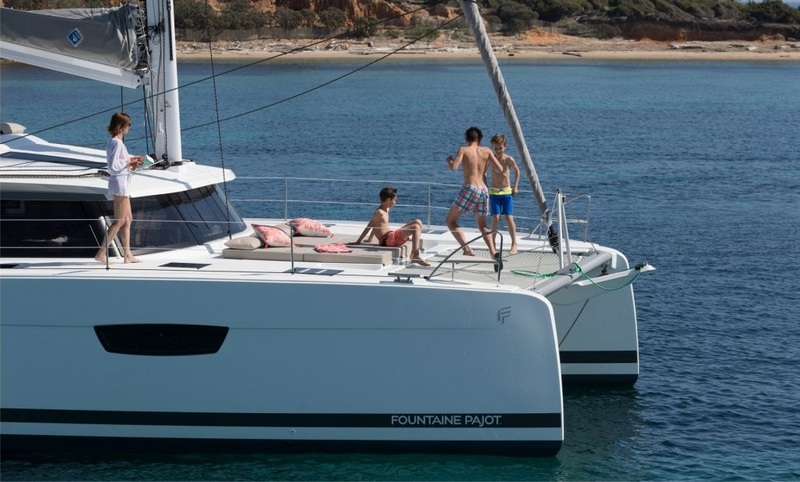 Striking aura, strong lines and timeless elegance. 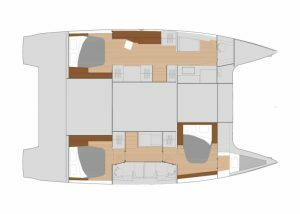 The expansive cockpit is intelligently designed for entertaining and provides all weather dining and living area. 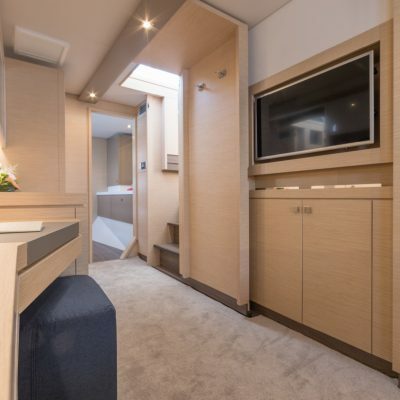 The exquisitely crafted open saloon is bathed in bright natural light, and the comprehensively equipped galley has a large central island and an abundance of storage. 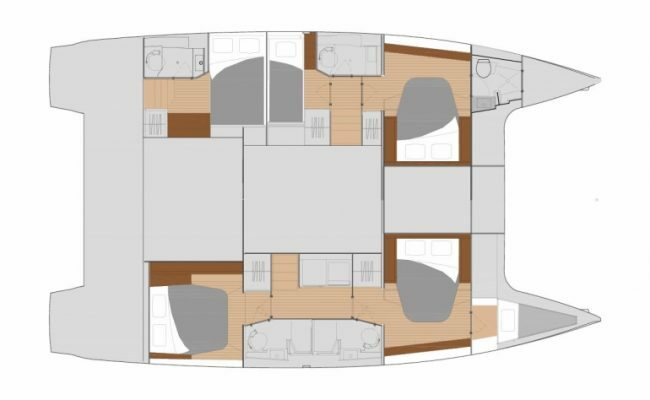 Available in two layouts, the 3-cabin Owner version which features a decadent master suite, or the five-cabin version with four double en-suite guest cabins as well the convenient crew quarters. 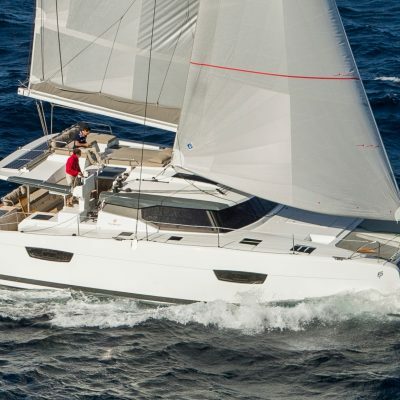 Optimised weight-to-volume ratio delivers exceptional balance and stability for an unforgettable sailing experience at any speed. 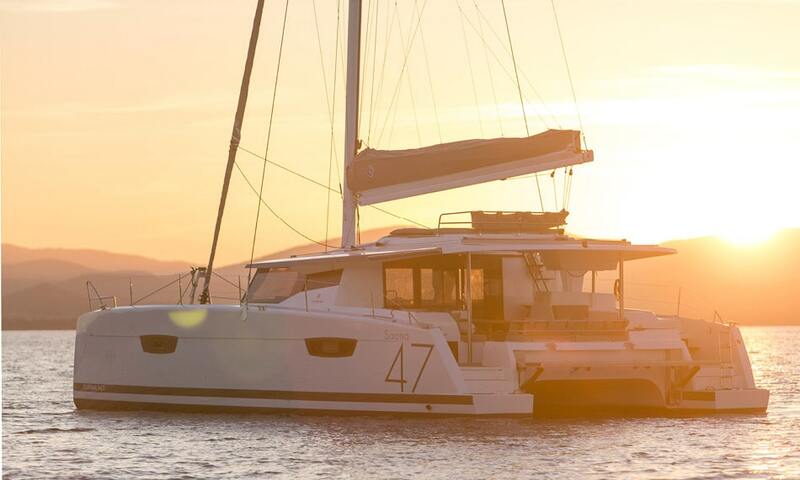 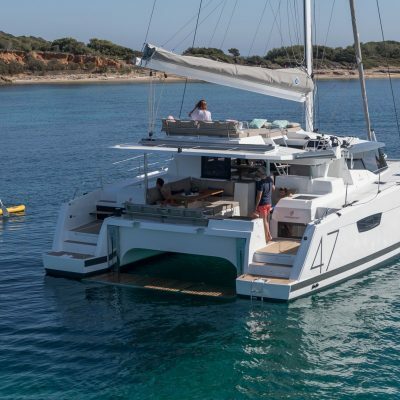 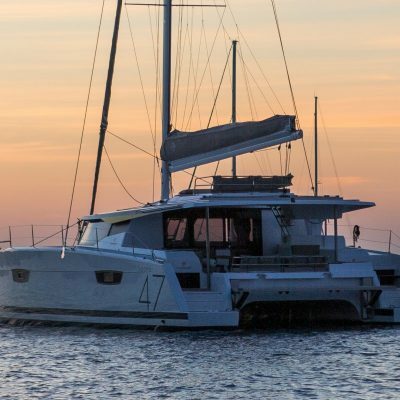 If you would like to place an order or simply find out more about the Saona 47 contact us here, or email Robin Hodges, our yacht sales manager robin@horizonyachtcharters.com Or please scroll down to read more about this remarkable catamaran. 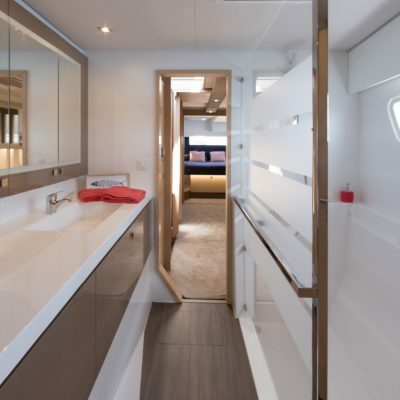 The extensive cockpit is the social centre of the boat. 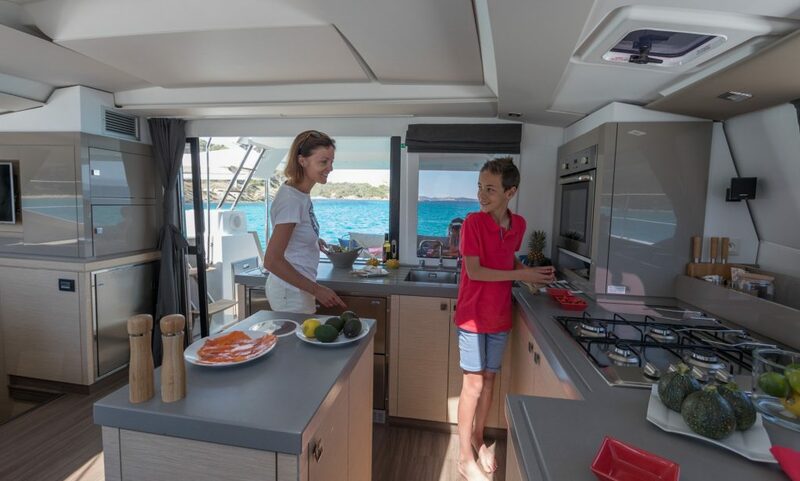 There’s a forward-­facing couch across the transom, with a BBQ grill and cutting board at its starboard end. 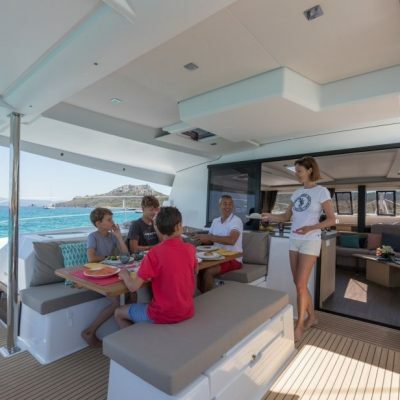 The dining table has L shaped settee and a central fixed seat amidships, comfortably seating 8. 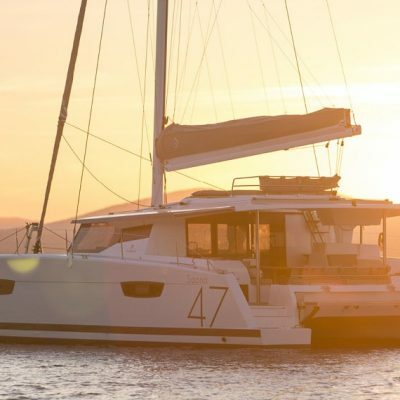 To starboard there’s a fridge and lounge chair built in under the helm seat, and hatches in the hardtop bimini open to allow a refreshing breeze to flow. 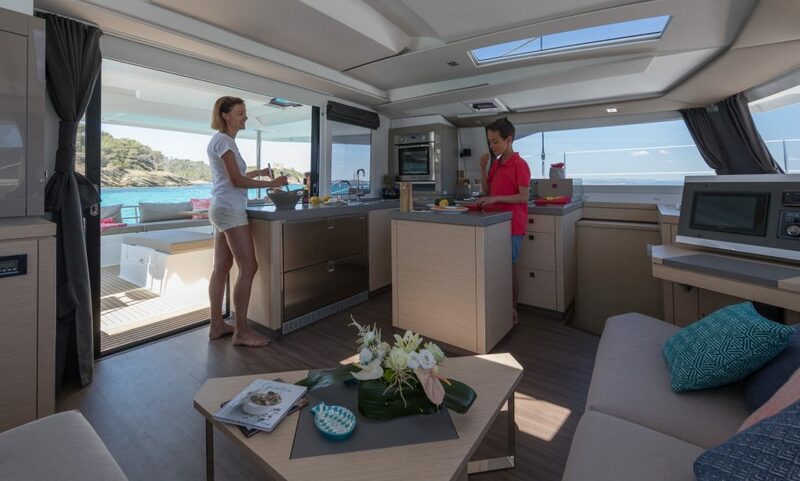 This whole area is ideal for entertaining and relaxing. 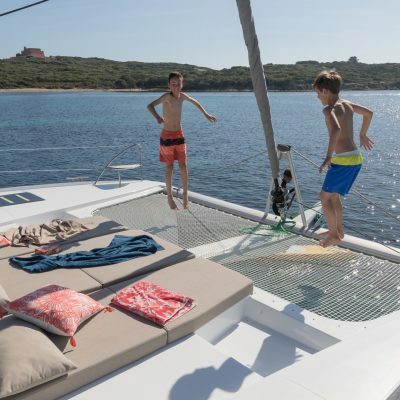 The well known ‘beach club’ tender-lift lowers the dinghy efficiently, and provides a wonderfully big swimming platform extending all the way between the hulls. 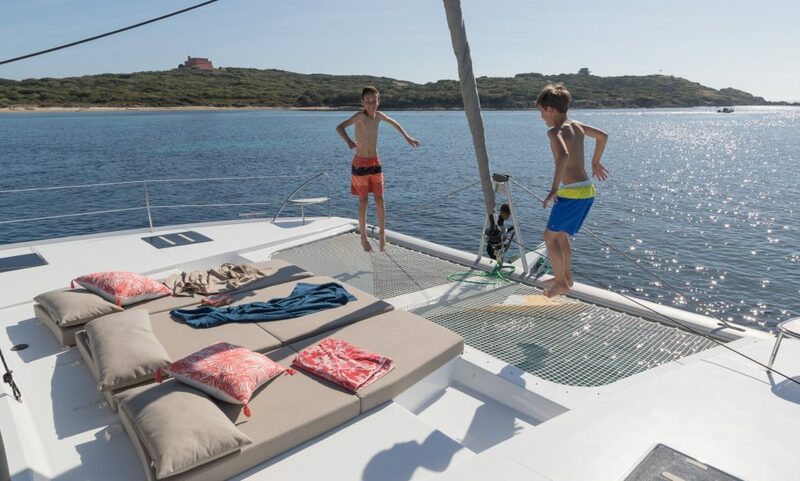 When raised, which can be done with remote control, the platform is well clear of the bridge-deck. 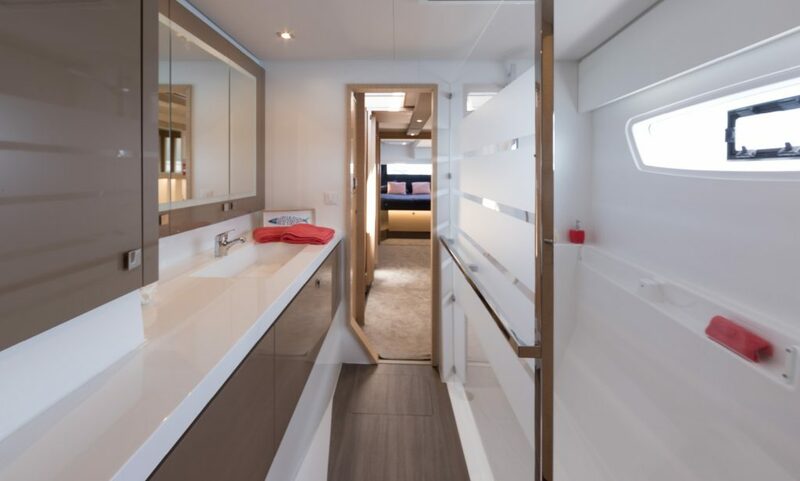 Through large sliding doors and a sliding window you find an innovative galley with a very practical layout. 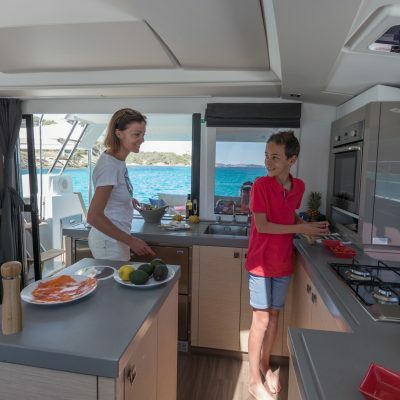 It comprises an L-shaped galley to port, with two fridges, sinks, plenty of countertop and storage but adds a simply designed island amidships. 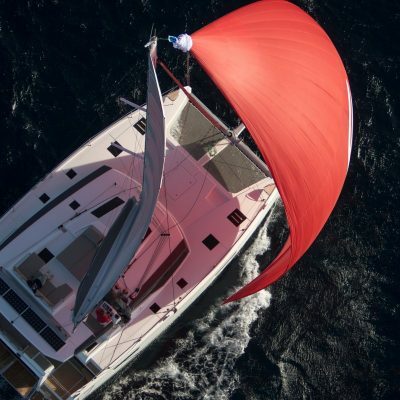 This is a very nice touch. 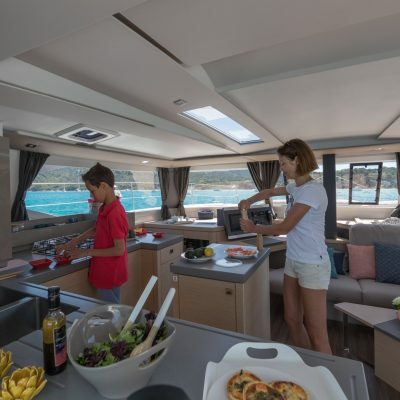 There is a corner-mounted convection oven and countertop stove also along the port side. 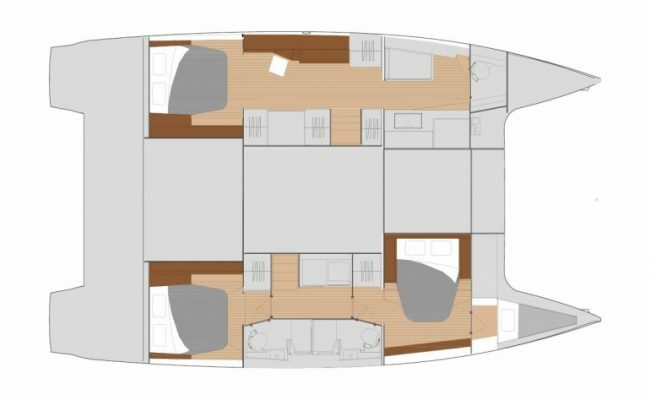 The settee is L shaped and is sumptuous with deep comfortable cushions, a fantastic area for putting your feet up and relaxing while others are working away in the galley. 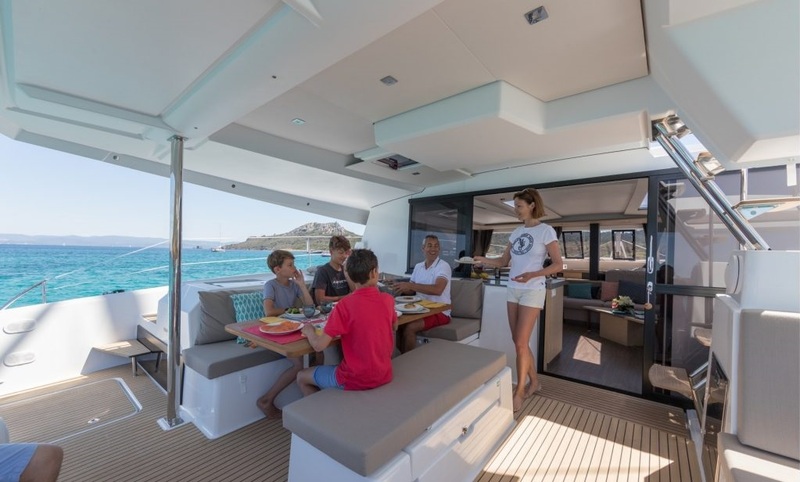 The electrically operated hi-low dining table is an option. 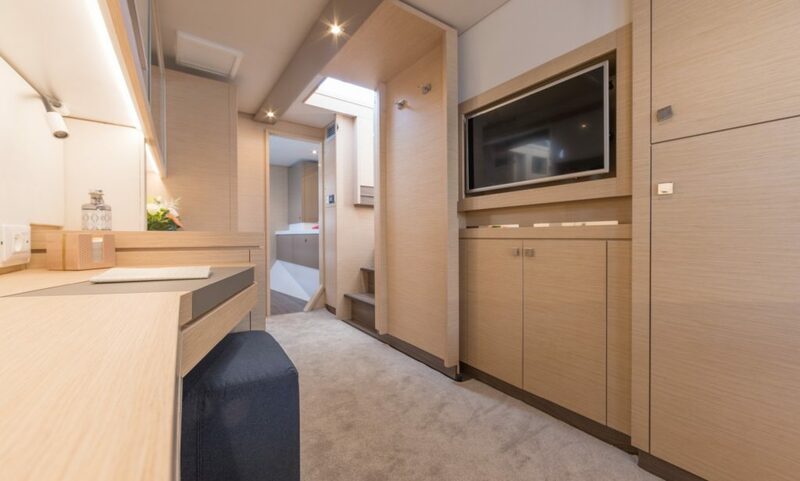 It can revolve and expand so it’s close to the settee at table height or when lowered fully makes a extra berth. 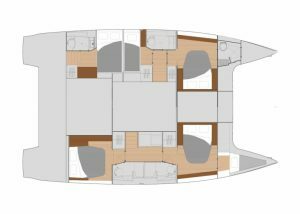 Or it can swivel, so you can use it as a smaller coffee table with plenty of walk around space. 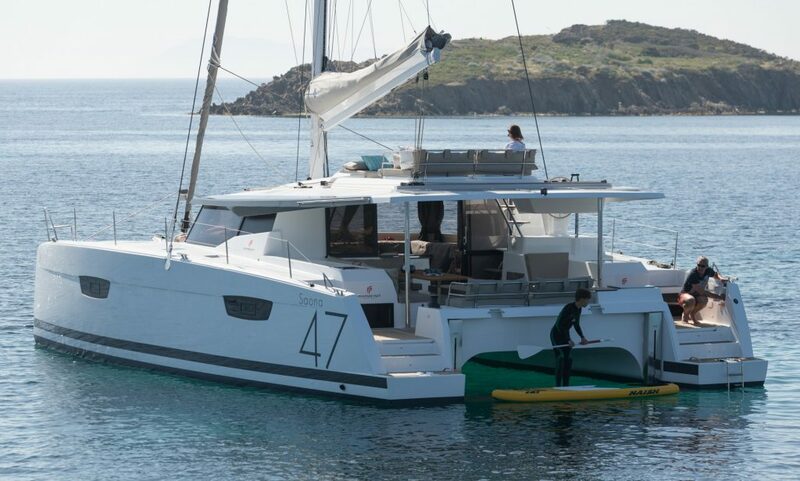 (The coffee table is standard). 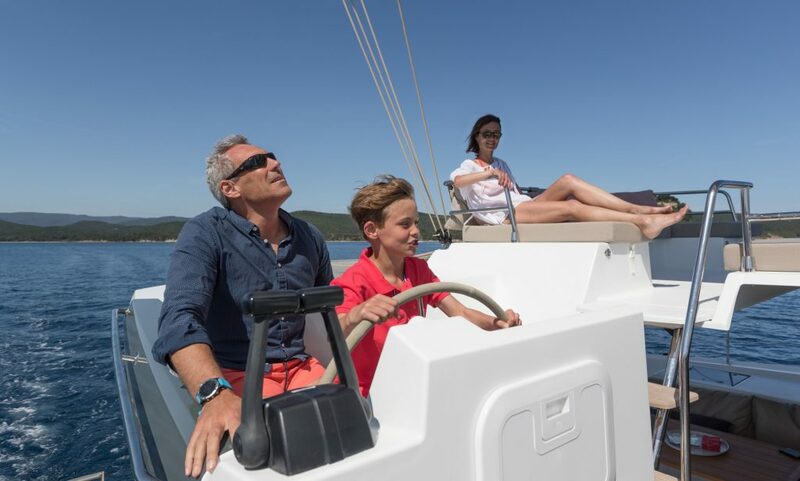 Set forward to port is a forward angled navigation station with excellent visibility and uses the extended settee as a seat. 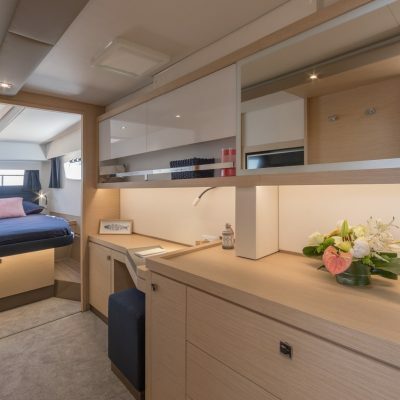 The whole area has a very open and spacious feel. 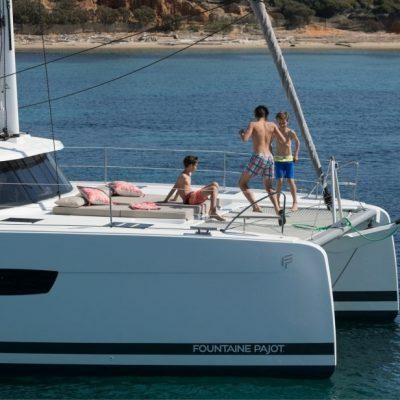 The helm station, which can be entered from the cockpit and side deck, is similar to the arrangement FP employs on the Astrea 42 and the new FP45. 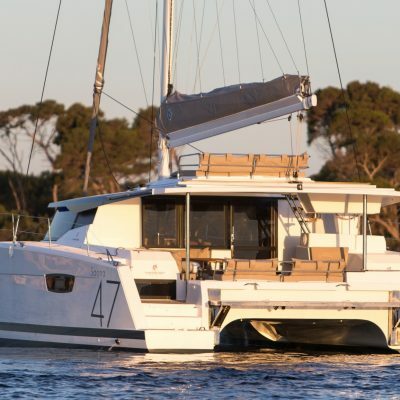 On the Saona 47 the helmsman sits on a three-person bench seat with the wheel and engine controls mounted just forward on a pedestal. 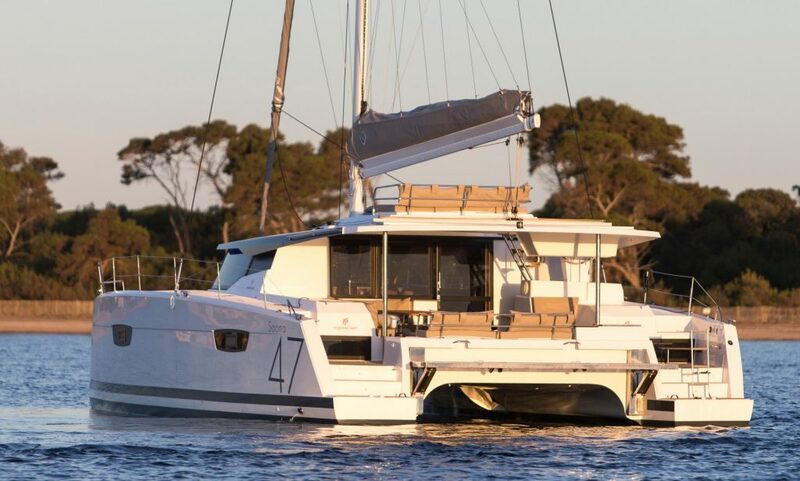 All the sail controls come to three winches atop the coach roof forward of the helm. 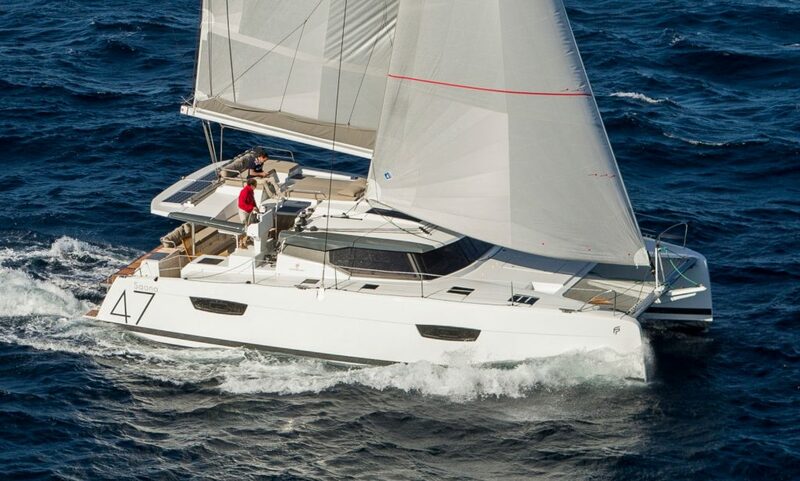 There is a neat tail storage bag for excess rope and the passageway runs in front of the helm-station giving plenty of room for crew to work the lines and keeping the helm-station clear. 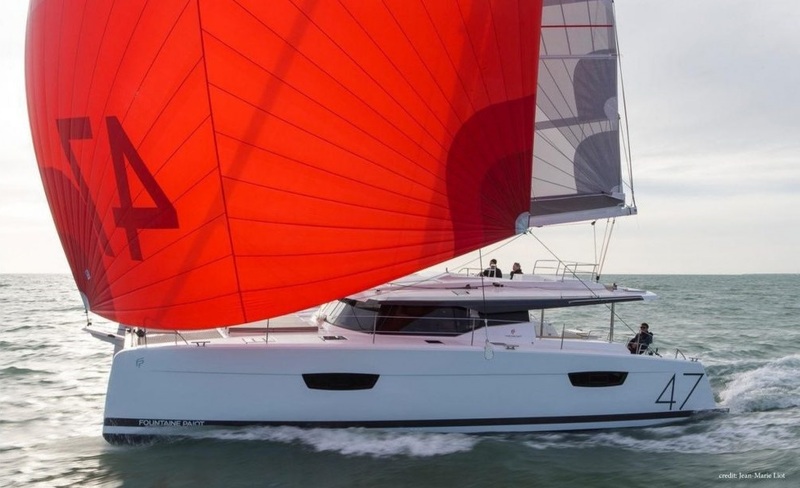 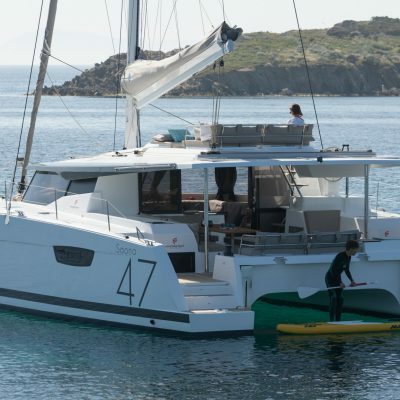 The Saona 47 is responsive and easy to handle under power; she is agile and will turn in her own length, and despite her size feels light to the touch. 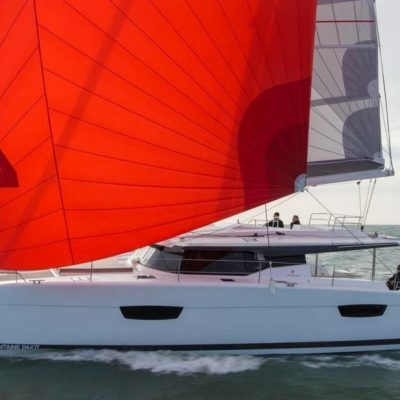 She cruises comfortably at over 8 knots in smooth water at around 2400rpm. 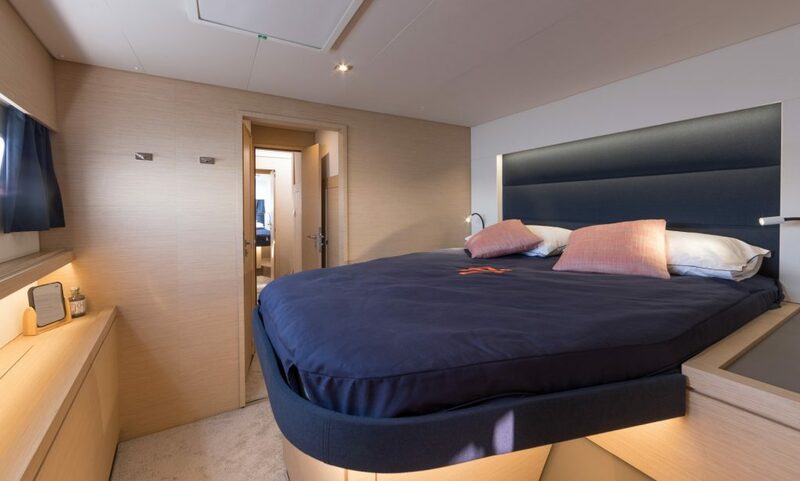 The 5 cabin 5 head version has, on the starboard side, a double island berth in the aft cabin and an athwartship island berth forward, with en-suite heads and showers between. There is a single crew cabin in the bow. 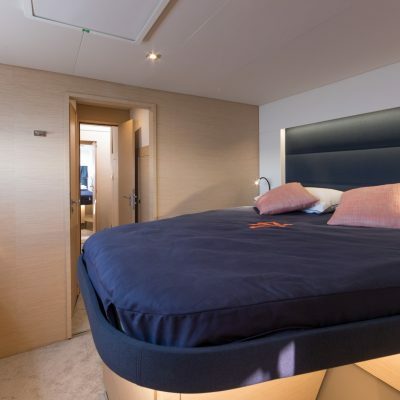 To port, a single-bunk cabin sits amidships, between the aft double cabins and a forward island double set athwartships, all with en-suite heads. 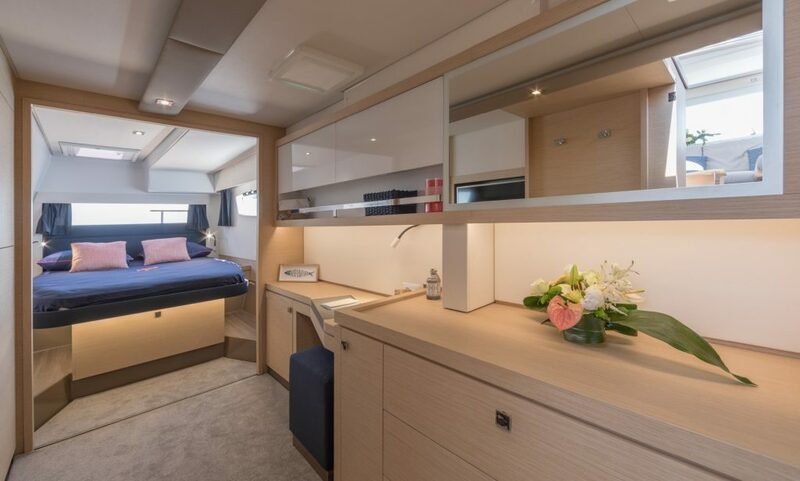 The Maestro layout features an awesome Owners suite that takes up the entire port hull, with a huge double island berth aft, desk and cabinetry amidships, and a head and large separate shower forward. 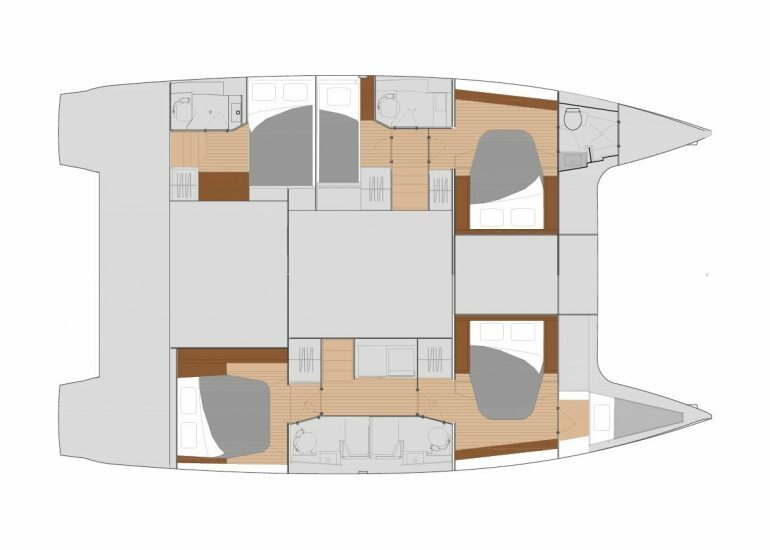 The starboard hull is laid out in the same way as the charter version. 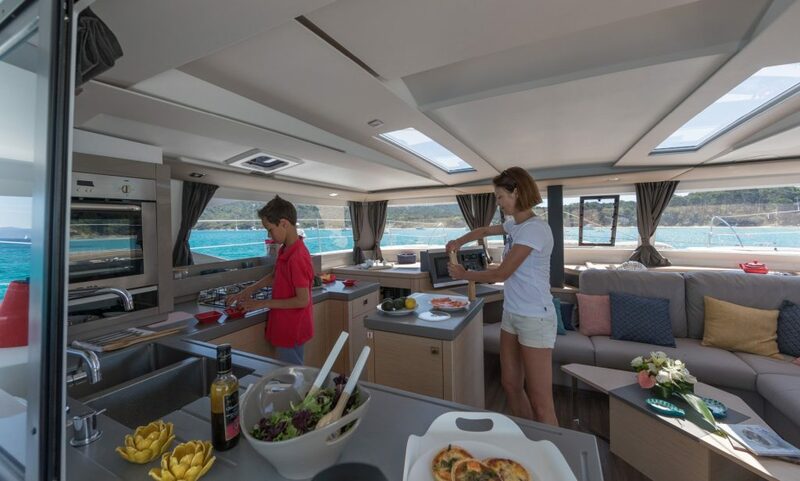 There is a choice of upholstery and colours below, and whatever you choose you’ll find a combination of functionality and contemporary style.